In the United States, the eastern and Gulf coasts are in danger of being slammed by hurricanes from June through November because the waters in the North Atlantic Ocean are typically at their warmest while the Sahara is at its hottest during the same time period. A hurricane is a complex weather system that can be simply explained as a funnel of warm, wet air. It is a non-frontal system whose air has a distinct circular flow. One starts forming for the United States when hot air over the Sahara is released into the North Atlantic. 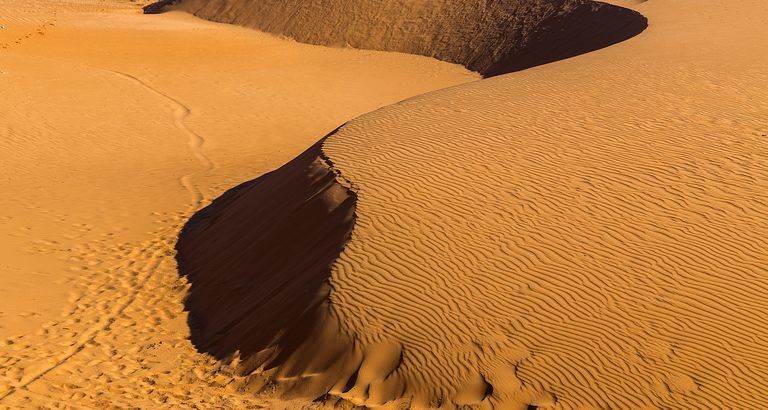 The Sahara, whose land mass is almost that of the continental United States, is the largest “hot” desert in the world. It is also the second largest desert overall and covers 10 percent of the African continent. (Antarctica is the largest desert in the world and is classified as a “cold” desert.) In the Sahara, the day-night-day temperatures can swing 30 degrees in a few hours. Great swirling winds over the Sahara carry sand over the Mediterranean, bringing storms into England, and drop sand on the beaches of eastern Florida. The temperatures of the land mass of western North Africa grows hot, and the air over this area rises to create the African easterly jet. A column of hot air swirls upward three miles and spreads as it races to the continent's west coast, where it dips toward the ocean. The air picks up moisture from the warm water and continues its race westward. The flow of the ocean and the spin of Earth combined with the dry winds of the desert and the warm, moist air off the Atlantic horse latitudes make this desert-born weather grow. As a weather system travels across the Atlantic, it spins and flies over the water and can grow in intensity as it picks up moisture, especially when it arrives in the area of Central America and the warm Eastern Pacific waters. When wind speeds in the weather system are less than 39 miles per hour, it is classified as a tropical depression. At 39 to 73 miles per hour, it is a tropical storm, if its winds are rotating. This is the point where the World Meteorological Association gives the storm a name, on a predetermined schedule that refreshes names every six years, alternating male and female names in alphabetical order. Next up the storm intensity scale after tropical storms are hurricanes. The lowest category of hurricanes happens at 74 miles per hour, category 1. Sometimes tropical storms and hurricanes spend their life out over the open ocean, never reaching landfall. When they do hit land, tropical storms and hurricanes can do great damage through spawning thunderstorms that cause flooding and tornadoes. When a hurricane was big enough to cause a lot of damage, then the name is retired and a new name replaces it on the list.